→The ABCs of Drum Sander Reviews: Which Are the Best of the Bunch? A drum sander is a cheaper alternative to a belt sander (whether it's a stationary or mobile one). 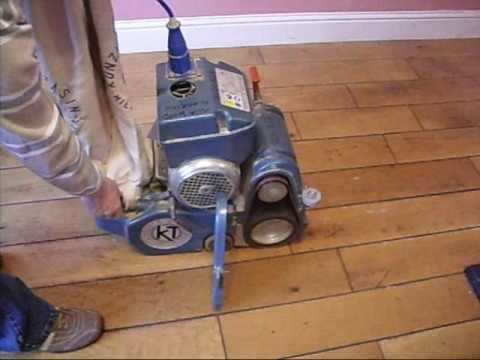 This sander's specific purpose is to smoothen out the finish of wooden floors. As many other drum sander reviews would take note, it utilizes a rotating drum instead of a continuous loop or belt of sandpaper to abrade surfaces to smoothness. A belt sander is a device that makes use of a sanding or course belt that revolves continuously on its axis like a fast miniature treadmill for smoothening, trimming, scribing, and sanding purposes. Meanwhile, stationary drum sanders are the smaller, cheaper alternative to stationary wide belt sanders (although it's prohibitively large compared to mobile sanders). Both types of sander have stationary and mobile forms. While there are inexperienced people who find using a drum sander harder because it takes a bit of getting used to tuning the machine up, those who are experts at drum sander technology mostly prefer this device over belt sanders for their affordability and comparable sanding capabilities. To use a mobile drum sander, you need to first get a feel for it. These are big and heavy machinery, after all. You should get used to holding the device. When attempting to bring a hardwood floor to a smooth finish, you should start on a non-visible area. If you make a mistake, you can avoid complications since the area isn't visible anyway. Once you get the sander moving, you can sand the board from side to side or on a diagonal direction. The idea here is to smoothen out the floor evenly without missing any spots. Meanwhile, a stationary sander should have individual boards feed unto it until their entirety is sanded smooth. Here are the different drum sander types. This sander allows you to maneuver your boards easier, thus letting it leave a smaller footprint and making it more versatile to use. On the flipside, the machine makes you lose out stiffness and you'll more than likely have to run the material through twice to sand both sides versus just doing it once. The closed-end type of drum sander has a typically wider construction. It's designed for fast sanding of huge work pieces and large materials. Because its drum is wider, you'll end up doing more work at roughly twice the rate of its open-ended counterpart. Of course, the extra bulk also means you have to pay more money in order to get one. Double-drum sanders also offer twice as much sanding power as the open-ended variant, but this time it goes about it by doubling its sandpaper content. This means that you don't need to have the paper changed as often as a standard drum sander. You can also do two-stage sanding by putting in two different paper grades (course sandpaper for the rough edges and fine paper for finishing and detailing). Here are the specifications to watch out for when shopping for the right drum sander. Your drum sander should be good at dust collection to keep saw dust or metal particles from entering the device and ruining its internal moving parts. This is also a major consideration for workers or family members with allergies. Instead of having a variable speed rate measured in feet per minute, (stationary) drum sanders require you to change the feed rate so that softer woods don't end up sniped, scratched, or even friction burned. You want to have more control over how the plank is fed into the machine to better adjust to various sandpaper grits. Your drum sander should have two sandpaper attachment modes available to it. You can either hook and loop the sandpaper or instead peel and stick it. The hook and loop technique is preferable to the hobbyist woodworker since you can just remove the paper before it loses its grit. Peel and stick requires adhesive and uses paper that's ruined when removed. There are drum sanders that are as small as 8 inches or those industrial-level ones that reach all the way up to 37 inches. You should pick the sander that suits your needs, whether they're personal, commercial, or industrial in the level of work. Typically, a woodworker can work with a 16-inch sander and at 25-inches you're practically a woodworking workhorse. When choosing the top drum sanders, you need to categorize them by size. Sanders are most commonly available as 8-inch, 10-inch, 18-inch, 25-inch, and beyond devices. The 37-inch ones are usually reserved for furniture workshops or factory work. They vary from as big as a sewing machine to as large as a HVAC or small refrigerator. Choose the size based on your needs (personal or commercial). This 230-volt and 25-inch drum sander offers 5 HP or horsepower of pure sanding strength. It's considered a quality machine by people who use it because of its consistency. It's cost-effective enough to do the job of a comparatively more expensive belt sander. Your investment is secured with the Powermatic 1791290 mainly because of its heavy steel cabinet that can deal with rugged handling and a feed motor that's connected to a gearbox that's two-speed (it can go forward and reverse). You're also ensured of a mar-free finish with your sanded wood through its Durometer Rubber surface. The only thing that will be sanded down is the rough spots. The end result won't end up with any dents or imperfections when all is said and done thanks to the design and construction of the 1791290. In terms of pet peeves, the sandpaper it comes with is an issue. It comes wrapped with a 4-inch wide roll of Klingspor sandpaper but you can only purchase 3-inch paper rolls that are harder to wrap around the drum. Putting on the wraps also requires quite a bit of trial and error because of the lack of a template. This machine for some reason wraps in the opposite direction as other sanders. Meanwhile, theJET 649004K22X44, it's a highly recommended planer-like product that's capable of removing a decent amount of material in one pass (but not as much as a real planer power tool, admittedly). Its main claims to fame are that it requires minimal assembly, so that means easy setup from you, the conveyor bed ensures smooth feeds thanks to its precision-flattened steel conveyor bed, and the stock is quickly removed thanks to its 1.75 horsepower motor. It also easily collects dust to its 4-inch dust power. Management of load is also dealt with dependably with its propriety SandSmart load control. The machine is an all-in-all dependable sander that's quite silent for something so large and washing-machine-like in bigness. It won't easily trip your 25-amp circuit or end up with an overheated motor thanks to JET technology. In terms of downsides, the sanding drum parallel to the table tends to end up askew in some models (by as much as 0.375 inches). It's also difficult to attach the sandpaper belt to the drum. The second clip can't be seen and the clearance between the frame and drum is tight, so those with big hands will have issues in accessing the clip. The JET 649003K Model 22X44 is yet another 1.75 HP beast of a benchtop drum sander that's able to get the job done with many of the same technologies that its 49004K enjoys, such as its SandSmart variable feed rate that goes from 0 to 10 feet per minute as required and its aluminum drum that's precision-machined and self-cooling to ensure less downtime and smooth sanding every time. The motor it has is also capable of running continuously so that you can get a fresh supply of sanded planks and logs for your woodworking needs. It comes with an infeed/outfeed tables and stand that's mostly optional. I find this machine quite pleasing when I bought it even without the infeed/outfeed stand because it's easy to change belts with this piece of equipment once you get used to attaching it at the motor end. In terms of downsides, it's limited to certain customers ending up with just the bottom feed table and not the motor. This means its flaws are mostly from poor shipment of certain units rather than issues on the Jet 649003K Model 22X44itself. This sander is also quite heavy so find help when moving it around. The JET 628900 Mini is quite impressive for a 10-inch drum sander model. Aside from obvious advantages like smallness for better mobility (since many gadgets nowadays are experiencing miniaturization to make them more portable and less unwieldy to handle), the Jet 628900 Mini also has key specs like quick sander paper change to increase productivity and decrease downtime, 20 inches of wideness and capacity for sanding large-surface work pieces, large hand wheel to make adjustment easy, and a 4-inch dust port so that you can keep your work area clean because of all the collected sawdust. It even has the ability to change its feed rate from 0 to 12 feet per minute depending on the volume of your work. Finally, it has a motor that has 1 HP in horsepower rating, which means it's only 0.75 HP short of other models so it should dependably sand down all sorts of surfaces and work pieces big and small (except the exceptionally large ones that only bigger sanders can deal with). In terms of flaws and drawbacks, the belt it comes with has issues in tracking. While it's able to sand dependably for a drum sander its size, the belt still tends to eat itself from going off the side of the rollers. The Powermatic PM2244 has a lot going for it even when compared to its Powermatic 1791290 counterpart. It has an integrated LED control panel that shows you info on DRO, belt speed, and power being used by the machine, making it one of the more advanced sanders on this list. Furthermore, you're assured of an exceptional finish thanks to this sander's Feed Logic. This cutting-edge tech is also responsible for keeping your feed from being overloaded. Additional height reading is also done through the secondary absolute depth scale. This further ensures ideal finishes and dependable precision sanding. The Powermatic PM2244 also has a steel hood and a 4-inch dust port that ensures cleanliness around your workshop because all the dust particles are collected within that designated container. Meanwhile, its drum carriage is made of tough cast iron, which provides consistent performance and strength. In terms of flaws, Powermatic also has issues in quality control wherein faulty machines can end up on the doorstep of customers. What's more, because of its cast iron carriage, you still need to watch out for moisture and the like because unlike aluminum carriages, iron has a tendency to rust when not carefully maintained. Your ultimate drum sander choice should be based on the quality and size of the material you're sanding. If you need to sand down timber you've cultivated or scoured for yourself from the great outdoors (that is, logs you've chopped by hand), you need industrial-strength stationary drum sanders capable of handling the roughest and rawest of hardwood imaginable. You should also consider getting a mobile, handheld, or floor-based planer drum sander for installations that already exist (like already installed floors that require smoothening). If you're running a production shop, then maybe those 8-inch or 10-inch sanders won't be able to cut it. Production-size 37-inch sanders should be of interest to you instead. Again, the 16-inch sander is a good place to start and 25-inch ones usually cover all bases for personal woodworker hobbyists and even small commercial-grade applications. Floor drum sanders, meanwhile, should be capable of maintaining perfect square edges when you pass them through your rough floor like a lawnmower or a mop. These ones require higher speeds than your typical stationary sanders that have wood fed to them.